This challenge has moved but you can still sign up here. YEAH! I'm all signed up and will post soon! Thanks ladies for such a great challenge! Oh this one looks right up my alley! I'll do a post tomorrow when I'm more awake! Lol! I am waivering between FASCINATED and ADDICTED at the moment - I already have a list of 12 books to read next year for my own book group, but I am sure that I can cope with another list!! Will post later on when I have chosen my book titles. Participated in an Historical Fiction Challenge in 2008 (Apr - October) and enjoyed this. Especially when it opened up a huge range of books I had not been aware of. Looking forward to doing this again this year! ok, no really, I'm done with the challenges for 2010. This is my last one. I'll probably end up at obsessed.... but I'll just say that I'm addicted. Okay, I'm not sure I did it right! I put in the URL to my blog where I have posted the link and picture for the challenge in my sidebar. On that blog, I will be posting about each book as I read it. I guess then I will need to put in the URL for each review. I have chosen my books and listed them on my blog, together with a link back to this site. Great challenge. I'm all signed up. My post is here. I've signed up and I've got a post coming up soon! What a great challenge and yes, sign me up!! I don't know what level I will be "challenging" myself for the coming year but I am going to be a part of this one. I love reading historial novels, especially Victorian ones. Again, count me in!!! This is starting a little late, jsut read 3 historicals in the pat month, and I really dont read many. But now I will hold off until next year. I'm in with this challenge at the obsessed level since I read historical fiction all the time I should be able to do this one. 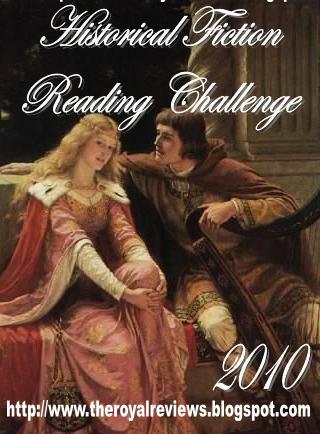 Glad I found out about this challenge since I am an avid reader and historical fiction writer. I am starting out with the Addicted Level of 12 historical fiction reads. It will be my next blog post! I may up it to 20 not sure yet! Happy Reading Everyone! I want to join!! Of course I love this challenge- history is all I read! Thanks- this should be so much fun. I'm goinmg for Obsessed- we'll see! Just joined. I don't have my book list yet, but it should be fun. Thanks for hosting! I can't wait to start this challenge! Thanks for hosting it! I m in too1 Thank you ALaine! I need to sign out of this contest, if you would please remove my name from the list, thank you. Sorry for the inconvenience. Love historical fiction! I'm choosing "fascinated" but will probably end up reading more! I'll post my list as I go along if that's ok. Yes Nancy it is fine! All signed up and ready to go! I don't think the 20 books will be a problem... its going to be figuring out WHICH 20 to pick! Thanks for hosting! Thanks for the great challenge. I'm signing up at the Obsessed level - I love historical fiction! I'm in. This sounds like a great challenge. I LOVE historical novels, and history in general, so this challenge is tailor-made. I'm aiming for the Obsessed level and will put a starting list on my blog, as soon as I get my bookshelf ordered. I am so ready for this one add me too ! Thank you Elaine I love it. I picked obsessed. Going to do Fascinated. I probably should go more as historical happens to be my favorite. I'm going for addicted, but will probably reach obsessed before the end of 2010. My blog is not solely devoted to books, so I'll just post my reviews (if they satisfy the challenge) here, if that's okay. I'm in and linked my post. I'm so glad that it is a year long challenge now!! I'm committing to 20 books. I'm excited for this challenge! I'm going to see if I can reach obsessed reviewing only YA about poc :) Thanks for hosting such a great challenge! I signed up and posted and am officially obsessed! Ok, I'm in! I'm going for the addicted level, but I might become obsessed! So excited about this challenge. I am sure I will definitely reach the Obsessed level :) Happy reading everyone! I am hoping this challenge will help me get some of many tbr books read. I am going to list my books as I go along. This should be fun! Looking forward to seeing what everyone chooses to read in 2010! So many wonderful upcoming releases in the new year! I am going to sign up and I am going for obsessed since those are my favorite books to read. I don't have a blog so I will post the books I read in a list and will post my reviews on goodreads as Angela H.
Going to attempt the Fascinated level! I'm going straight for the obsessed!! This is my first challenge, so as I say, "Go big, or go home." I'm in and looking forward to it. Sorry for the doubble sign-up- I messed up my URL on the first one and it doesn't look like it can be edited. It's fine Laurie, it's all fixed! I've signed up for obsessed! I'm really looking forward to this challenge. I'm looking for Mr. Linky but he appears to be sleeping right this moment =) You may find my post on this challenge here. Thanks! I've signed up for "addicted" 12 books. Sounds like fun! I'm a little late, but since my first book of the new year just happens to be historical fiction, I don't think it will matter! I am going to try for the fascinated level on this challenge this year. Recently got back into reading Historical Fiction and decided to join this challenge to encourage me to read more. Great Challenge! I actually think I can manage this one. I'm going for obsessed. This is my first reading challenge! :D Count me in i#m aiming for ~Obsessed and will see how i do. I'm so excited for this challenge! Thanks for hosting it! I'm in for this one. I'm aiming for 12 books. Have completed my second book - DREAMING THE BULL - BOUDICA - by Manda Scott. The book is the story of the world's famous warrior Queen. (I always thought she was Boadecia, but in actual fact her correct name was BREACA. Boudica - means the ruler of the tribes. I couldn't immerse myself in this story - seems to be more a tale of the Romans and in particular, Breaca's brother BAN, who had supposedly died at the hands of Amminios, brother to Caradoc. (Caradoc was the husband of Breaca). BAN was taken into slavery by Amminios, and then went on to join the Roman Army. He then returned to Britain, and was fighting against his own people. Maybe it was the mood I was in at the time, but I wasn't interested enough to finish the book. burrum, thanks for the review. I was wondering about this book. Although you are right sometimes if you don't enjoy a book it can be that you were not in the mood for it. I'm joining! This will be posted on my blog soon! I'm doing the Fascinated level and just posted my books. I'm a late comer but I couldn't pass this up! pinuccia, welcome to the challenge. Don't forget to link up your reviews so we can all read them. Hi! I just wanted to let all you gorgeous readers know I WROTE a historical fiction novel that you're welcome to read for free. :) Send me an email - zuel_88@hotmail.com and I'll send you the PDF so you can read it. It's about a rich and handsome 17-year-old guy who quits the good life and runs off to the Civil War with three good friends. There's adventure, love, sacrifice, battles, and great descriptions of the 1860's. I'm doing a classics challenge with historical fiction in it, and I can't wait to meet more of you lovely readers! Welcome to the challenge Judy! Hi! I’ve found your blog accidentally but I think it’s so entertaining1 I like it so much and I will certainly link it to my friends. I think your idea is great and challenging! Keep up with it! For those, who don’t like to write there’s always custom essay writing. I've recently discovered your blog and I really like it! I created a blog in english a few days ago, where I write my reviews, and I would like to participate in this challenge! But it got too confusing to keep track, I made a whole separate page for my challenges. I have not got my list of links up yet but will be doing it tonight. My current status is 15 HF so far. Here is the forever home for them now. Thank you so much Alaine and sorry it took me so long to visit. I just finished my goal of 'Fascinated'! This is one of my all-time favorite historical film, and I've read a lot of them. I think Historical Reading Challenge is a book which has a challenge in it, I think such stories are really nice one to get know about. To better understand the nature of history we will have to take a closer look at the historical method and particularly at its shortcomings. This is some real nice reading. We will have to leave review. Thanks for taking your time on this. This is a nice piece of history. We will share this with the class. Historical things always inspires me thanks for sharing. I enjoy historical fiction so thanks for mentioning this.My favorite recent historical fiction book is "The Other Boleyn Girl" by Philipa Gregory.Good luck with the challenge.